The title of this post may have caught some readers by surprise. You are probably asking: “What do you mean by young?” For the purpose of this topic, I am addressing my comments primarily to young Catholics who fall in the range from age 20 to age 45 respectively. I realize that one could make a very good argument for feeling young at any age, but since many of my critics fall in the age range I am addressing, I thought I would keep my focus here. At age 60, I am part of a large group of Catholics who experienced the transition from the pre-Vatican II Church to the post-Vatican II Church. Those in the group I am addressing in this post are of the post-Vatican II generation. What I have discovered in recent years is that there is a strong yearning for a meaningful spirituality in their lives, whether it is in the context of Catholicism or via their personal journeys. If you have watched my videos on YouTube, you are aware that I have occasionally criticized a few young Catholics, only because of comments they made that appeared to be sexist in scope. Because I have been working diligently toward a church that does not discriminate on the basis of gender, sexual orientation of marital status, I have logically taken a defensive stance when citing persons of faith who simply want a more inclusive church. Having said this, I also want to issue praise when such praise is due. Videos I have made have either been in the entertainment or church-reform modes. However, I have also recently reached out to a few persons with whom I have experienced disagreements in recent years. As stated, most of these persons fall within the 20-45 range. The few young Catholics who have criticized me refer to themselves as traditionalists. While I have differed with them on gender-related issues (I support the ordination of women and they do not), I nevertheless find myself in full agreement with their desire for a liturgy that is more reverent. I am intrigued by the fact that many young Catholics who refer to themselves as traditionalists have expressed a love for the Latin Mass, and correspondingly, they have made an effort to acquaint themselves with the early music of the Roman Catholic Church. In my personal life, I have come to embrace a variety of liturgical styles, with reverence taking a high priority. It is the younger generation that will need to mold the church of the future. At age 60, I consider myself to be part of a bridge that extends from the pre-Vatican II church to the post-Vatican II church of today. Whether the church of the future becomes more traditional or more contemporary will be up to young persons of faith. It is my prayer that as they contemplate the future, they will work toward a liturgy that is both reverent and inclusive. You are probably aware by now that the Vatican announced last week that the process for married Anglican priests converting to the Roman Catholic priesthood will be easier than it has been in the past. I certainly want to welcome Anglican priests who convert to Roman Catholicism for the right reasons - namely, reasons of faith. However, when the reasons become political in scope, I hope the Vatican won't be too eager to bring these priests on board. In particular, if conservative Anglican priests are seeking admission as Catholic priests, simply because they are opposed to the ordination of women and gay men in their church, I believe there is a serious problem. In the video above, I try to raise corresponding issues in this regard. On the positive side, Anglican priests who are admitted to the Roman Catholic priesthood can at least prove to the Vatican that Holy Orders and marriage can indeed be compatible. However, it is my hope that the Vatican will come to see the double-standard they are exercising. In brief, married priests from the Anglican tradition will be welcomed, and at the same time, the Vatican will continue to ostracize Roman Catholic priests who choose to marry. I hope you will watch my video and then write your own commentaries on your respective blogs. As a life-long resident of the City of Rochester, I am delighted to take part in the City's celebration of its 175th anniversary this year. An important part of this long history is the Rochester Philharmonic Orchestra. 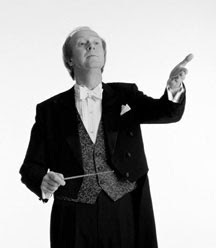 Brenda (my wife) and I were deeply saddened to learn that the RPO conductor, Christopher Seaman, will be stepping down at the conclusion of the orchestra's 2010-2011 season. However, on the bright side, Christopher will be named Conductor Laureate, which means he will return once a year, following the 2010-2011 season, to conduct a concert. I am also delighted that Christopher will be with us in 2012 to celebrate his 70th birthday. It is especially enlightening that despite our loss, Christopher will have an opportunity to conduct many of the world's orchestras. I personally want to thank Christopher Seaman and the RPO for the many outstanding concerts they have given for Rochesterians and visiting guests. As a fitting tribute, I made the video which is part of this blog post. In the video, I personally thank the orchestra and Christopher for being important parts of my life. I have spent a lot of time in recent years on research pertaining to my family ancestry. This work culminated in a very large booklet I put together for my surviving relatives. 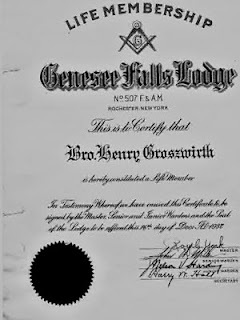 It was interesting for me to discover that my paternal grandfather, Henry Grosswirth, was a proud member of the Freemasons for 60 years. Sadly, the Catholic Church continues to excommunicate anyone who joins Freemason lodges, due to the Vatican's fear concerning any organization that utilizes secretive oaths or symbols. Freemasons have received a lot of publicity in recent years, due to fictional works written by Dan Brown - most notably, 'Angels and Demons' and 'The Davinci Code.' In reality, the Freemasons have a long history with the Catholic Church, inclusive of its members having built the vast majority of long-standing cathedrals in Europe. However, due to secret rituals and symbols, the Vatican continues to demonize the Freemasons. It would be fairly easy for me to join the Freemasons, due to my grandfather's long history with them. However, I have never expressed an interest, due to its male-only membership. I personally want to thank all the Masonic lodges around the United States for all the charitable works they continue to do. 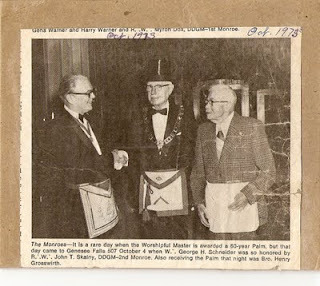 I have posted three items that pertain to my grandfather's long history with the Freemasons. You will need to click onto them to generate larger images.